Welcome to the 8th annual College Radio Day! On Friday, October 5, hundreds of college radio stations will come together to celebrate the unique medium of college radio. To find a participating college radio station, please visit here. 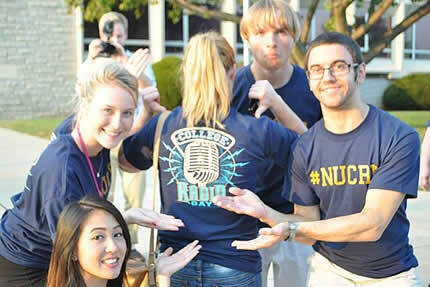 To see the latest news regarding College Radio Day, please visit here! The original idea for College Radio Day was conceived by Dr. Rob Quicke (General Manager, WPSC FM, William Paterson University, NYC market), and was founded in December 2010 by Rob, who worked with Peter Kreten (General Manager, WXAV FM, Saint Xavier University, Chicago market) to help develop the idea. The aim of College Radio Day is to harness the combined listenership of hundreds of thousands of college radio listeners throughout the world and to celebrate the important contribution of college radio by uniting for this one day. The aim of College Radio Day is to raise a greater, international awareness of the many college and high school radio stations that operate around the world by encouraging people who would not normally listen to college radio to do so on this day. It is hoped that those people who do tune in like what they hear and become regular listeners. The organizers of College Radio Day believe that college radio is one of the last remaining bastions of creative radio programming, free from the constrictions of having to be commercially viable, and a place where those involved in its programming believe passionately in its mission. College radio is the only free live medium brave enough to play unsigned, local, and independent artists on a regular basis. Indeed, many famous and successful bands today, owe their initial break to being played on college radio. Put simply, college radio is an important part of the media landscape because of its unique and fearless programming. The organizers also hope that College Radio Day can also be used a fundraising vehicle for those individual stations that choose to participate, benefiting from the extra attention their station will receive on that particular day. Being a participant in this day is free for all college and high school radio stations (AM, FM or online) so that together, for one day, we can lift the profile of an important form of media: college radio. It’s a day of celebration. It’s a day of live music and special interviews. It’s the day college radio comes together. Since 2012, the annual event is known internationally as World College Radio Day, as more than 30 countries around the world now celebrate this occasion.